Despite having a sweater, two pairs of socks, and a pair of mittens on the needles, I cast on for another pair of socks last night. That's Theresa's Whiskers and Pawprints pattern, and Jessie's wonderful sock yarn in Shell. The yarn has been sitting on top of my living room yarn basket ever since I got it. Almost every day, I would pick it up and ask it what it wanted to be. It's such a pretty but sophisticated pink, with subdued streaks of blues and purples. It needed to be something special. I've had the pattern since Theresa first put it up and knew that it needed a quiet yarn, the better to show off the pattern. Suddenly, last night, I knew these two belonged together. 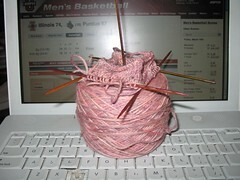 I thought I would finish the picot cuff while I "watched" the Illinois-Purdue game online this evening. "Watch" as in "watch ESPN.com update the score and list of plays and wonder how far behind the updates are." However, it turned out to be a real nailbiter and held my attention. It went to overtime, but Illinois, after a sorry season and ranked 10th out of 11 in the Big Ten, won! Did you see the beautiful Christmas stocking on Grumperina's blog? When I saw it I KNEW I had to knit it. You see, when I got to Mom's for Christmas this year, my stocking was missing. Mom had used Blackie the Dog's stocking (one of those tiny stockings) in its place! I don't know what happened to mine, and it wasn't fancy or anything, but I didn't want to upset Blackie by stealing his stocking! So I had been thinking about knitting one for myself. Grumperina said the kits are "everywhere," but that's only true if you live out East. I ordered one from Nordic Fiber Arts. That's a pretty stocking except I would probably make the foot a smidge longer for more loot! Ha ha! What a cute sock pattern! Love the yarn color too-I don't blame you for starting another project with "ingredients" like that! 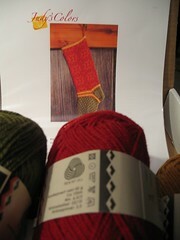 Love that yarn for the sock. Very pretty.